Doing it Differently: The Runes are done! 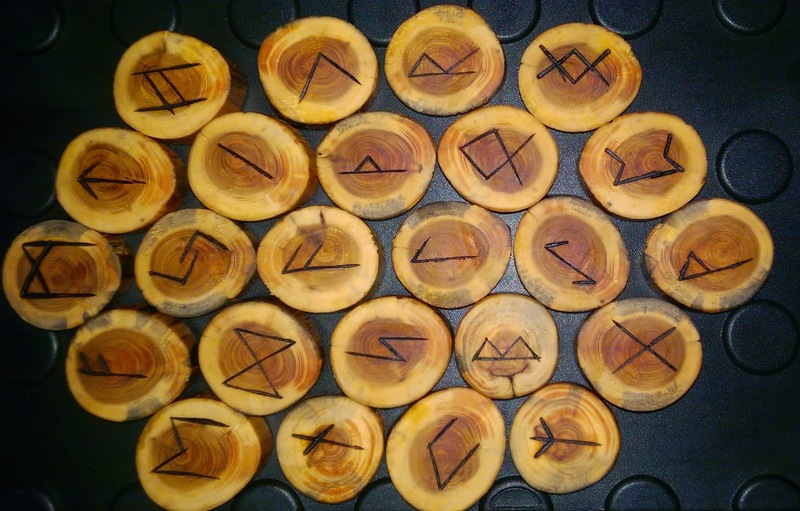 These runes are mostly hand made by me, the only place I had machine assistance with in the cutting of the wooden disks from the chosen branch. The branch that was chosen was a dried limb from a fallen cedar tree. that fell in a thunderstorm. The cedar was chosen as the grove I belong to is Cedarsong, the fact that it fell during a storm, ties it in closely to Perkūnas one of the Baltic gods of the grove. The disks were cut from the same branch that I use to represent the Tree on my alter. 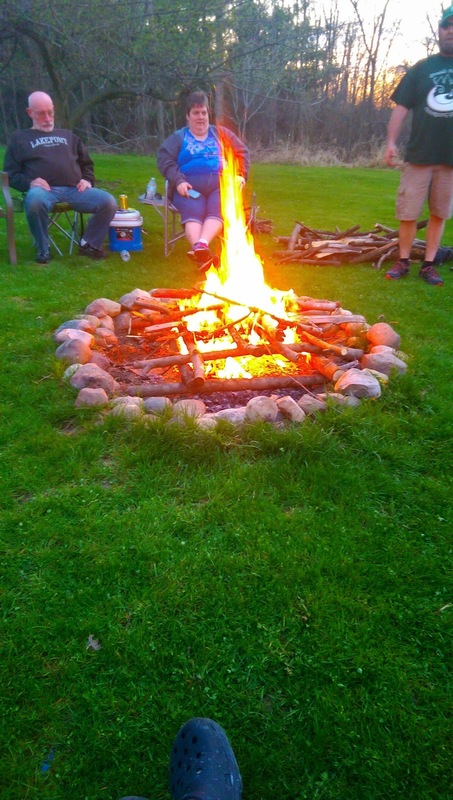 Once the disks were cut, I took them to the Beltane 2015 fire watch, and sanded them throughout the night, doing my best to invest as much positive energy into the wood as I could. I then burned the runes into the disks, and polished them with a mixture of oils and beeswax imbued with cedar wood essential oil. I am very pleased with the final product. I have enough blanks to make 2 more sets of rune stones from this branch, and I do plan to make them. I just need to determine what the will be used for. Most likely as gifts of auction items. I will begin to use these runes for my daily rune drawing. * Here is the more on that latter, though I was planning on this being my nature spirit set of runes, I do not think that this is the case. (I will look for a set to use with the nature spirits.) With the work that went into this set, the bulk of this work being done during a fire watch, the energy I poured into them, and the strong tie the have to Perkūnas, I think this set is going to me my general use set, and the set that get used most often. I will get a nature set, and that one and the other2 will be used when I really need to focus on one set of the kindred. The fire that was lit for the Beltane ritual, (and that I helped watch all Saturday Night) this is right at dusk, just after my senior druid lit the fire and blessed the fire. For a good portion of the night I sat here and chatted with friends old and new, and sanded the disks for the runes. The energy around the fire was perfect for crafting, and I believe the work that went into the runes that night helped imbue them with clean positive energy.